Hi, I’m Tim Farley. I want to talk to you about skepticism and the Internet. That intersection has been my specialty for a couple years now. I think some very interesting things are happening with Internet technologies right now, and we as skeptics need to be poised to take advantage of them. My hope is that I can inspire you, every one of you, to make contributions to skepticism online, from the comfort of your own home. You may be surprised how easy it can be. It’s an interesting coincidence that my talk is on Sunday. It was on the Sunday of TAM5, which was five and a half years ago, that I decided I wanted to be active in skepticism. I decided to do that via the Internet. That was because that’s my day job, so I have skills I can apply there. But I think now, in 2012 every skeptic needs to be involved this way. Regardless of whether you are a computer expert or not. All of us. I don’t think I need to belabor the point that the Internet is important. People get their news, their entertainment – everything from the Internet. That means they also get their pseudoscience, their paranormal, their quackery and all that other irrationality from the Internet too. It is up to us, the skeptics, to try to intercept them when they do. We have to be there in the way, before they get scammed. And we are. There are hundreds of skeptic websites, blogs, podcasts and so on out there, taking on all aspects of pseudoscience, the paranormal and so on. And new ones are being created all the time. I mentioned on the Friday panel my census just of the skeptic podcasts that are out there. 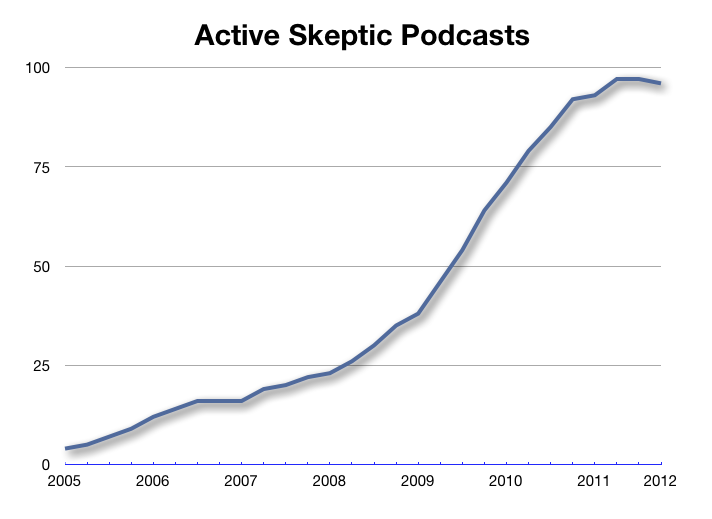 At the time of TAM5, there were about 16 podcasts that regularly included skeptical topics. Right now there are over 95. Similar growth has been seen in blogs and other efforts, although I don’t have exact numbers to share with you, I know the number of skeptic blogs and web sites is well north of 750. Back at that time if you wanted to get involved in skepticism online, starting a website or a blog or a podcast was the main way. It’s still a great way to do it, and we still need more people to do that. But there are also other ways to get involved in skepticism online now. And some of these newer methods, while they don’t have the prominence of a blog or a podcast they can have considerably wider reach. I’m talking about ways that we as skeptics can get the attention of vast (television sized) audiences, sometimes with as little as a mouse click. That is if we are paying attention and take the time to do it. But before we get there, let’s look at some of those skeptic resources that are out there already. There’s Doubtful News, which aggregates all those crazy news stories that skeptics are talking about in one place. Huge time saver for skeptics. The Oh No! Ross and Carrie podcast, which instead of talking about skeptical topics, actually goes out, interacts and reports. What a novel idea. If I can self-plug here a bit, the Today in Skeptic History iPhone app, which was launched just before TAM last year, that has all sorts of info about the history of skepticism, based on today’s date or on searches. I researched that info and the JREF turned it into an app. Skeptic’s Dictionary now has a special kid’s version. In South Africa there’s a site called Quackdown that is a database of unsupportable health claims, and they’ve released their site code as open source. In the UK the Nightingale Collaboration coordinates skeptics as they complain to regulatory agencies about quacks. Skepticism & Ethics which is a group blog that explores the moral and ethical values of being a skeptic. There are many more, such as Project Barnum, Guerilla Skepticism on Wikipedia, Immunize for Good, Cognitive Dissonance, Desert Air, Skeptics Guide to Government and so on and so on. To underline how many different sites and projects there are, there’s even something called Skeptics on the NET, which is a site that simply catalogs all the other sites and projects and podcasts. The need for that catalog site points toward one problem I see. To a certain extent, we’re not educating ourselves as to what’s out there. Let me get a show of hands, just now when I was showing screen shots and logos of skeptic web sites and tools, how many of you saw at least one there that you had never heard of before this weekend? (It looked like at least half the room raised their hands. -TF). Yeah. We need to know what’s out there and available, folks. We need to get out and expand our horizons a bit, and those of us who are in the know need to promote these other projects. Tell a friend. Don’t just talk about your own projects on Twitter and Facebook, help promote your fellow skeptic. Now most of those projects I mentioned were websites or podcasts. There’s a whole other much more exciting thing happening which is the creation of electronic skeptic tools. For instance, Fishbarrel, which is a piece of software that plugs into your web browser and helps automate the process of filing an official complaint with agencies like FDA, ASA, MHRA and so on. It’s like having a deputy skeptic at your side. I showed you one smartphone app, there are several others such as the Creationist Claims Index, Skeptical Science for climate change info and the Skeptic’s Dictionary is here too. If you’re face-to-face with a believer or a denier these are awesome debating aids to have in your pocket. Another browser plug-in is called RBUTR, one of its creators is here at his first TAM. This is still new, but it has the potential that someone looking at an alt-med website can, in one click, get taken to a refutation of the claims on a skeptic website. I’m very pleased by all this activity. It’s a realization of what I talked about in my paper presentation at TAM6, which was called Building Internet Tools for Skeptics. We need more tools like this. And we need more people wielding these tools. None of these tools do any good without skeptics using them every day. And that brings me to another obstacle in our way – complacency. These quotes are powerful rally points, but we have to be careful with them. If we go too far we can run afoul of the just world hypothesis. That’s the psychological phenomenon where your mind wants the world to be fair; to make sense. Because if the world makes sense, then science will certainly win. But just world is a cognitive bias. It’s the same cognitive bias that results in victim blaming. The danger here is if we believe too much that science will win, we may delude ourselves into thinking it doesn’t need our help. We need to watch out. We may be so proud of this beautiful marketplace of ideas that is the Internet, that we don’t notice our opponents are stealing our customers right out from under us. I see this sometimes when I talk about SEO and online marketing techniques to skeptic webmasters. Some skeptics argue with me that it doesn’t seem fair. They prefer for skeptic and believer websites to have equal visibility in Google and for it to be a fair fight. Frankly I don’t understand this argument at all. Our opponents are doing everything they can to push their nonsense. Some of them like the Discovery Institute have multi-million dollar budgets, as we heard about in Christine Shellska’s paper this morning. They use this to lobby and advertise and otherwise promote irrationality. Why shouldn’t we use every effort and technique we can to combat that? I’m not talking about illegal or unethical techniques. I’m not talking about manipulative stuff, like Penn railed against yesterday. I’m talking about proven techniques that web professionals use to make their content more visible and more palatable. I’m talking about better writing to make your points clearer and more understandable. I’m talking about good graphic design. I’m talking about search engine optimization. We need to be taking those pains! We have to make that effort to bring the truth of science to light. And when I say we, who am I talking about? The JREF? The Skeptics Society? They have their role, but that’s not what I’m talking about. I’m talking about you and you and me. Most of the projects I’ve mentioned today were not built by national organizations. They didn’t have a multimillion dollar budget. They were built by people just like you, who just saw a need and had an idea and went out and built it. People like Simon Perry and Sharon Hill and Alan Henness. People like Susan Gerbic and Eric Weiss. People like Hayley Stevens and Shane Greenup and Amy Davis Roth. And thousands of other skeptics like them across several continents. Many of these folks are here at TAM. I want to see more of your faces up here. Any one of you could build a project using online tools, often absolutely free. Just like these folks. Now you may say, “But Tim, I’m not a webmaster or I’m not a software developer, I don’t have the skills necessary to do those things!” Well first of all, I think you may be overestimating how hard it is to be a webmaster. It’s not that hard. But hang on, keep listening, I’ve got a great alternative for non-techies later. One of the reasons we need more faces up here is we are missing opportunities. Let me tell you a story about one. In 2009, because of some incidents in professional sports, the US Congress was lobbied to amend the Dietary Supplement law here in the US, the one known as DSHEA. This is a terrible law, skeptics complain about it all the time. In February 2010 Senator and former presidential candidate John McCain introduced a bill to fix this law. It had the backing of some huge organizations like NFL, Major League Baseball and Consumer Reports. They called the effort Supplement Safety Now. So skeptics were dancing in the streets, right? Not exactly. I’ve been able to find exactly 3 skeptic blog posts about this. Three. And remember I said there were over 750 skeptic blogs? And out of those 3 blog posts, only one of them actually said anything about writing to your Congressperson or supporting this law. Of course, immediately the alt-medders went bananas. They all wrote and called their Congresspeople, and acted as if Armageddon was nigh. If you just type McCain DSHEA into Google you can see literally thousands of posts like that. Now maybe this bill really didn’t have a chance, but we’ll never know because we (you and I) just stood by and let it happen. There was no skeptic effort to support this legislation. What a missed opportunity! We dropped the ball on this one, completely. So I was curious. I did some research on what was in the news and on skeptic social media that week. It turns out that this happened two days after Lancet retracted Andrew Wakefield’s infamous 1998 MMR paper. That was huge news for skeptics, and there were justifiably tons of posts about it. But clearly we let ourselves get distracted. The lesson we should learn here, we need to spread out and specialize. We can’t all be blogging about the same top story. Someone should have been tracking legislative actions using online tools, and been ready to rally the troops. Nobody did. In looking at what happened that week in February 2010, I found another blog post that might illustrate another point. On this particular post, a very prominent atheist blogger invited his readers to bomb a poll. If you’re not familiar, bombing or crashing a poll is when a blogger invites their readers to all go vote in one of those silly, completely unscientific electronic polls that you see all the time. Of course you are encouraged to vote for the scientific or skeptical answer in the poll. Everyone knows these polls are meaningless. Even the newspaper web sites that typically host them don’t care about the results. Polls are just a bid to add some interactivity – they are just hoping you’ll come back the next day to see the poll result. That’s all. So what is the point of bombing them? I say there is no point. I say it is a colossal waste of time and effort! But how much? Let’s look at that. We can’t look at that 2010 poll since it was 2 years ago and guess what, the poll is gone. Of course it is – even the sites that post them don’t keep polls around very long after they’re done. So let’s look at a poll from this year, and let us choose one where we can see the vote counts. There was one in February that was taking nominations for kid vacation destinations, and someone noticed the infamous Creation Museum was ranking at the top of the poll. Here’s how it looked at the beginning. So this blogger sent his readers there, and several other bloggers piled on. There were 6 blog posts and 5 tumblr posts that I can find, plus a bunch of blog comments and social media posts. At least ten thousand votes were cast for the top few science destinations in an effort to dislodge the Creation Museum. Now of course, we don’t know how many votes were specifically caused by the blogging. So let let’s lowball those ten thousand votes and say only three thousand of those votes were from poll bombing. You can vote once a day, but you have to go back to the website, scroll down through a long list, vote, and wait to see the vote take effect. Let’s assume that took a minute each day. So a conservative estimate is three thousand minutes got spent on this effort. And that’s a low estimate, ignoring all the blog page views and comments. Three thousand minutes is fifty hours of effort that got expended on this. 50 person hours of work. And guess what? Not only did the bomb fail, but the website ignored the voting anyway (as they said they would) and left Creation Museum out of the final article. What a waste. What could you achieve with 50 person hours of work? That’s more than a full work week. Well actually you can, and you do it through crowdsourcing. This is exactly what my workshop on Thursday was about. This has been a big focus of my blog for the last two years. Crowdsourcing is this thing that’s been enabled by the internet, where thousands of people come together to work on a project. They each do a tiny little bit of work, but the end result is huge. This is the same thing Pamela Gay was talking about yesterday in her talk – Moon Mappers. That’s a crowdsourced science project. But there are crowdsourced skeptic projects too. And what’s great about this is, I know not every skeptic wants to have a blog. Not every skeptic has time to do a blog, frankly its very time consuming. Likewise a podcast, you need audio equipment and a good speaking voice, maybe that’s not for you. But our most valuable resource is time, and these crowdsourcing projects let you capture that lost time and put it to good use. So what can we channel some of this energy that goes into poll bombing and blog arguments into. What are these skeptic crowdsourcing projects? There’s a plugin you can put in your browser, that helps warn you about scams and hackers and such on the Internet. It’s called Web of Trust. One of the ratings that Web of Trust keeps is the trustworthiness of a website. Do you trust an alt-med quack? Do you trust psychics? I don’t. So why not give them a rating that reflects that? It takes two clicks for a skeptic to cast that vote. And those clicks add up. And if someone out there has it loaded, here’s what they see when they Google something that has bad ratings. See those red circles? They mean those are bad sites. What if you click one of those links anyway? Here’s what you see. You see that on any of a number of quack websites when you have Web of Trust installed now. Skeptics did that. There’s a poll bomb that actually does something. And because Facebook uses Web of Trust too, that means you can put a warning like that in front of nearly a billion people. But you have to do it collectively. Another way to go is editing Wikipedia. This takes a bit more of an effort, you have to learn a bit. And Wikipedia encourages the general public to edit it. But it’s worth doing because the Wikipedia articles about skeptic topics are right there in the top of the Google results. So whether we like it or not, most people out there are learning what they know about homeopathy, or psychic powers or the Roswell UFO from Wikipedia. I’ve looked at the stats, Wikipedia consistently gets 5 times to 50 times the traffic of a typical skeptic website, I used mine for comparison. Even my two best pages got trounced by the equivalent Wikipedia article. There are definitely some parts of editing Wikipedia that can be done one or two minutes at a time. You can fix vandalism on the page of a famous skeptic. Or make sure that latest news story of an indictment or retraction gets added to the quack’s biography as soon as it happens. It is not hard, and there’s lots of help on my blog and on Susan Gerbic’s blog. And it affects things outside Wikipedia too. 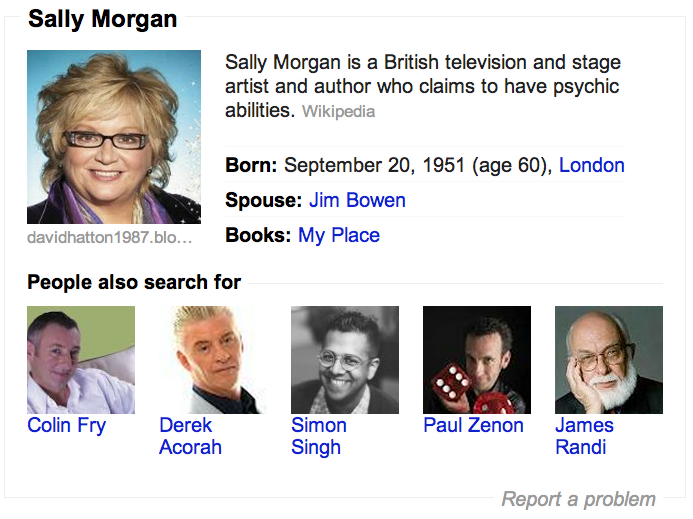 Here’s the results for Psychic Sally Morgan in the new Google Knowledge graph format. Which brings me to another example, not crowdsourcing but Internet based. After Sally got caught using an earpiece like Peter Popoff did, and there was a big uproar over it, Simon Singh went to her shows. And he noticed she stopped using an earpiece. And he wondered, did it make a difference? He noticed the ticket site had a “rate your show” feature, and the ratings were all visible, so he compiled them. 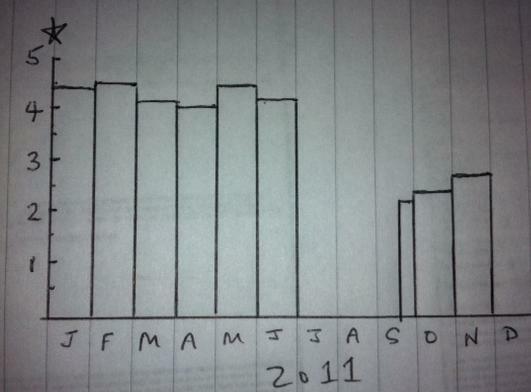 And he got this graph that shows a definite drop off in her ratings after she stopped. This is an interesting result that anyone could have compiled. Any one of you could have made this graph. Nearby, in Ireland, blogger Alan Rice noticed something odd about a new TV psychic. It was only ever this one psychic on camera, but they kept promoting many others with these pictures in the corner. He used a simple image search and lo and behold, it turned out to be a generic photo from iStockPhoto.com. He mentioned it to his friends and 25 of the psychics turned out to actually be stolen photos. He blogged it and it made the Irish news media. The news media loves stories like this. And again, any one of you could have used the same image search tool they used to find those stock photos and put that story in the media. Back to crowd projects, one is the question and answer site Skeptics Stack Exchange. This is a question and answer site that any of you can participate in. Here’s a question about L.Ron Hubbard I answered providing references, probably about 10 minutes work. This is now the #1 result for “L. Ron Hubbard formal education” in Google. I didn’t need any technical skills, just the ability to research the answer and write a summary. There’s crowdfunding where specific projects get the funding they need without much fuss. For instance, Surly Amy wanted to help more women come to TAM, so she set it up where people could buy stuff from her or just donate money, and it would go into a grant fund. This year she funded 22 women to come here to TAM, that’s over $8,000. That was done almost entirely with Internet crowdsourcing techniques, using social media and blogs to promote it, PayPal to move the money around and so on. There’s much much more to this crowdsourcing thing. We did an entire workshop on this on Thursday. There are lots of ways to contribute. And most of them have things you can do one or two minutes at a time, so it fits into your busy schedule. And there are more of these to come. I mentioned RBUTR earlier, which is brand new. There are a whole bunch of internet fact-checking tools in the works now, things like Hypothes.is and Truth Goggles and several other prototype projects. These are still being developed so you can’t use them yet. But we need to be ready when they become available. Many of these projects need a crowd to make them work, and we owe it to the general public to make sure that crowd is a skeptical one. So here are what I think are the key concepts I’m trying to get across. SPREAD OUT. We need skeptics who specialize and fan out to cover all aspects, so that we don’t miss these opportunities when they pop up. PAY ATTENTION. There are great tools out there and things happening all the time, but you need to be aware so you don’t miss them. DON’T WASTE YOUR TIME. Stop doing those things online that are wasting so much time, like bombing polls, or baiting Christians on Twitter, or getting into long arguments in comment threads that nobody will remember three months from now. STOP AND THINK about what you are doing. Will it have any effect? Will it make anything better? Will what I’m doing right now even still be here 6 months or a year from now? …and go work on Wikipedia instead. 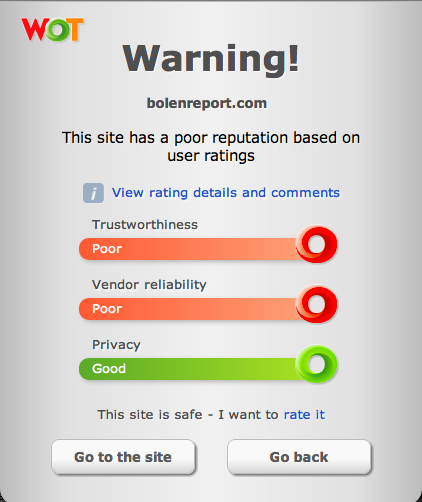 Or rate a site on Web of Trust. Or vote on some questions and answers on Stack Exchange. Or report a quack using Fishbarrel. Stop wasting so much of your time online. Do something online that will actually make a difference. (And if you do have some time left over after you’re done, we still need bloggers and podcasters too). I’m Tim Farley, you can find me as krelnik on Twitter or Facebook, and I’d be glad to give you some help. 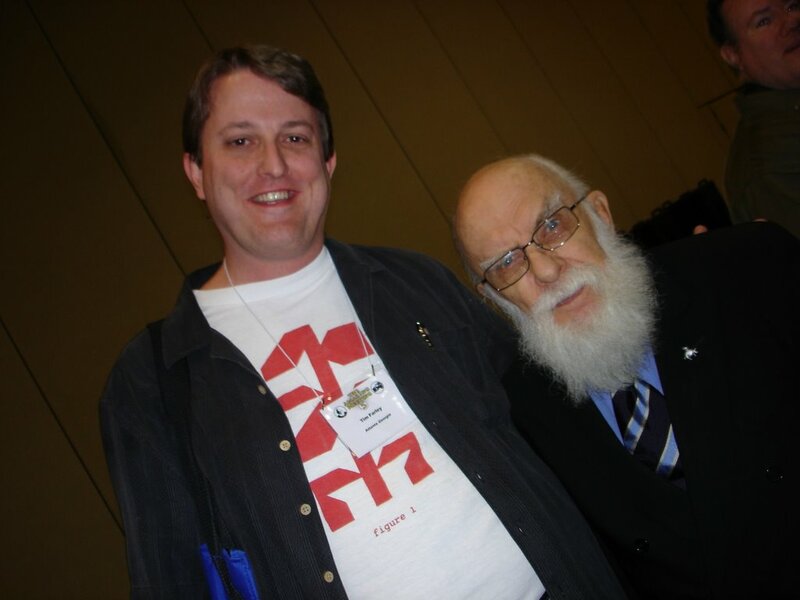 Thanks again to James Randi and the JREF for the opportunity to speak. A collection of helpful links and tips on how to get started doing what I recommend was posted on this blog last week. Update: Read the live reaction to this speech as it happened on Twitter. What is super funny is that I read over this blog and saw the pictures of the 8 skeptics above and it took me a long time to realize that my face was in there. I almost never see pictures of myself that I forget what I look like. Anyway, thank you for all that you do. Stay healthy!